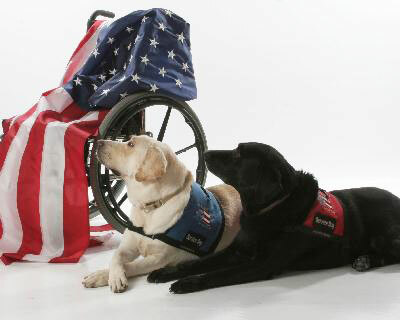 Photo courtesy of Patriot Paws. Watch as Cappucino helps his master dress and undress, fetches items like a bucket or a broom and even picks up trash. Mike his owner is paralyzed and was given Cappucino by Patriot Paws. The demonstration was held at the 2012 United Access of Dallas Open House. Despite the large crowd, the smell of barbecue and being in a new environment, Cap showed how a service dog can help veterans. Awesome demo video of Mike and Cap & great story!